A sedimentary rock is one of the three main rock groups, the other two being igneous and metamorphic rocks. It is formed by the consolidation of sediments that have been deposited and accumulated in layers. The sediments may correspond to material derived from various sites, generated by such processes as (a) the weathering or erosion of earlier rock formations, (b) the breakdown of biological materials (such as bones or shells), or (c) the precipitation of minerals from solution. This material is transported by the action of various agents, particularly water, glaciers, and wind. The deposited material is then compacted (squeezed) or cemented (bound) together or recrystallized to form new rock. 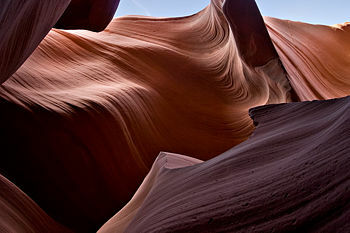 Sedimentary rocks make up a relatively thin layer of rock that covers about 75 percent of the Earth's land area. They provide important information about the history of the Earth. Their composition offers clues about the original rock, and differences between successive layers suggest how the environment changed over time. They contain fossils, and they often form reservoirs of petroleum and other hydrocarbons. On a practical level, they are widely used as construction material. Common sedimentary rocks include chalk, limestone, sandstone, and shale. Sedimentary rocks are classified into three groups, based on the material they were formed from. These groups are: clastic, biochemical (or biogenic), and chemical precipitate. Clastic sedimentary rocks are composed of discrete fragments or clasts of materials derived from other rocks. They are composed largely of quartz, along with other common minerals such as feldspar, amphiboles, and clay minerals. They sometimes contain more exotic igneous and metamorphic minerals. Biochemical sedimentary rocks contain materials generated by living organisms. They include fragments of bones and shells that are remnants of organisms. Chemical precipitate sedimentary rocks consist of material that was precipitated out of solution, such as by the evaporation of water they were dissolved in. conversion into new rock by processes such as compaction (squeezing together), cementation (binding together), and recrystallization. The weathering or erosion of pre-existing rock can be mechanical, chemical, or both. Mechanical weathering involves breakdown of the rock into particles without altering the chemical composition of the minerals it contains. Ice is the most important agent of mechanical weathering. Water percolates into cracks and fissures within the rock, freezes, and expands. The force exerted by the expansion is sufficient to widen cracks and break off pieces of rock. Heating and cooling of the rock, with its accompanying expansion and contraction, also aid the process. Mechanical weathering contributes to further breakdown of the rock by increasing the surface area exposed to chemical agents. Chemical weathering corresponds to breakdown of the rock by chemical reaction. This process dissolves some minerals and converts others into particles that can be readily carried away. Air and water are both involved in many complex chemical reactions. Igneous rocks are commonly attacked by water, particularly acid or alkaline solutions, and all the common igneous rock-forming minerals (except quartz, which is very resistant) are changed in this way into clay minerals and chemicals in solution. The weathered particles—in the form of clay, silt, sand, and gravel— and dissolved materials are transported by water, ice, and wind. These agents reduce the size of the particles, sort them by size, and deposit them at new locations, generally at lower elevation. The sediments dropped by streams and rivers form alluvial fans, flood plains, and deltas, or they reach the bottom of lakes and the sea floor. The wind may move large amounts of sand and other smaller particles. Glaciers transport and deposit great quantities of usually unsorted rock material as till. As the sediment builds up, the overburden (or “lithostatic”) pressure squeezes it into layered solids in a process known as lithification (rock formation), and the original fluids are expelled. The term “diagenesis” is used to describe all the chemical, physical, and biological changes, including cementation, undergone by a sediment after its initial deposition and during and after its lithification, exclusive of surface weathering. Sedimentary rocks are laid down in horizontal layers called beds or strata. Each new layer settles above older ones, in a process called superposition. There are usually some gaps in the sequence called unconformities. These represent periods in which no new sediments were laid down, or when earlier sedimentary layers were raised above sea level and eroded away. When the particles derived from earlier rocks become deposited, compacted, and cemented together, they form clastic sedimentary rocks. These rocks contain inert minerals that are resistant to mechanical and chemical breakdown, such as quartz, zircon, rutile, and magnetite. Quartz is one of the most resistant minerals, mechanically and chemically. 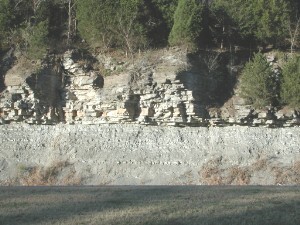 Clastic sedimentary rocks may be regarded as falling along a scale of grain size. Shale is the finest, with particles less than 0.004 millimeters; siltstone is a little bigger, with particles between 0.004 and 0.06 millimeters; sandstone is coarser still, with grains of 0.06 to 2 millimeters; and conglomerates and breccias are the coarsest, with grains 2 to 256 millimeters. Breccia has sharper particles, while conglomerate is categorized by its rounded particles. Arenite is a general term for sedimentary rock with sand-sized particles. The classification of clastic sedimentary rocks is complex because many variables are involved. The size (or range of sizes) and composition of the particles, the cement, and the matrix (that is, the smaller particles between the larger grains) must all be taken into consideration. Shales, which consist mostly of clay minerals, are generally further classified on the basis of composition and bedding. Coarser clastic sedimentary rocks are classified according to their particle size and composition. Orthoquartzite is a very pure quartz sandstone; arkose is a sandstone with quartz and abundant feldspar; greywacke is a sandstone with quartz, clay, feldspar, and metamorphic rock fragments present, formed from sediments carried by turbidity currents. Biochemical (or biogenic) sedimentary rocks include carbonate minerals generated by organisms such as corals, molluscs, and foraminifera. Minerals such as calcite (calcium carbonate) cover the ocean floor and later form limestone. Other examples include stromatolites, the flint nodules in chalk (which is itself a biochemical sedimentary rock, a form of limestone), and coal (derived from the remains of tropical plants subjected to high pressure). Chemical precipitate sedimentary rocks are formed when mineral solutions, such as sea water, evaporate. Examples include the evaporite minerals halite and gypsum. Sedimentary rocks contain important information about the history of the Earth. They contain fossils, the preserved remains of ancient plants and animals. The composition of sediments provides us with clues about the original rock. Differences between successive layers indicate changes to the environment that have occurred over time. Sedimentary rocks can contain fossils because, unlike most igneous and metamorphic rocks, they form at temperatures and pressures that do not destroy fossil remnants. Sedimentary rocks are also significant in economic terms. Being relatively soft and easy to cut, they are often used as construction material. For example, the White House in Washington, D.C., is made of sandstone. In addition, sedimentary rocks often form porous and permeable reservoirs in sedimentary basins in which petroleum and other hydrocarbons are found. This page was last modified on 27 August 2015, at 14:56.